New flash – neither do I. What makes you think ANYONE has time for that? Unless it’s your part-time/full-time job like those lovely people on TLC’s Extreme Couponing, you don’t really have the extra time for that kind of couponing. Jobs, kids, homeschooling, baseball practice, dinner, laundry, etc. Throwing in something confusing and time-consuming like “Extreme Couponing” just doesn’t seem to fit into our busy schedules these days. If you would like to get started couponing for the first time and don’t really know too much about it, I suggest reading 10 Days to become the Krazy Coupon Lady. The first-time I watched TLC’s Extreme Couponing, I was blown away. I had just read The Total Money Makeover by Dave Ramsey, and we were in the process of trying to figure out how to save more money so we could pay off all of our debt. We needed to cut corners somewhere, and I didn’t know where else we could cut them. I was intrigued by the TV show, and I excitedly said to my husband, “That’s it. I’m doing that!” I was motivated to save money this way, and I thought this could be one of our answers. So, I set out on a mission to learn how they bought so many groceries for almost nothing out-of-pocket. I was determined to figure this thing out. 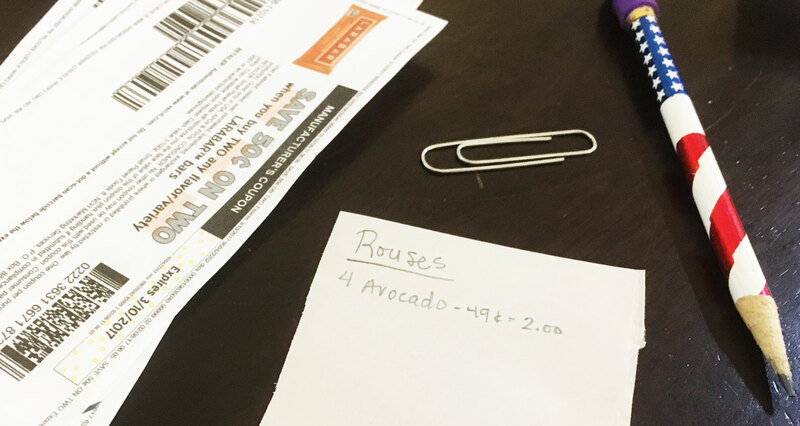 So determined, I could barely sleep at night because couponing was all I was thinking about during these beginning stages of this learning process. It’s a lot to take on all at once, and each store has their own set of coupon policies or rules. Also, we don’t have all the same exact stores here in our town as they do on the TV show. Nevertheless, I was on a mission to do it. For the next 3 months, I was reading lots and lots of information every day and making lots of mistakes (which is what happens when you first learn how to do something). This was no different than learning something else new. You must stick with it and don’t give up. Just like playing a new instrument or learning a new sport, you can’t throw in the towel after one try. I would make my list the day before, gather my coupons, and head out to 3-5 stores all at once. I only had one child to tote around back then since my oldest had started school, so it wasn’t as difficult to shop multiple stores in one day as it is now. After a while of extreme couponing, the news spread at church and around town that this was possible to do in our small town. People wanted to know how I was doing it. I taught a class at our church and a class at our library. 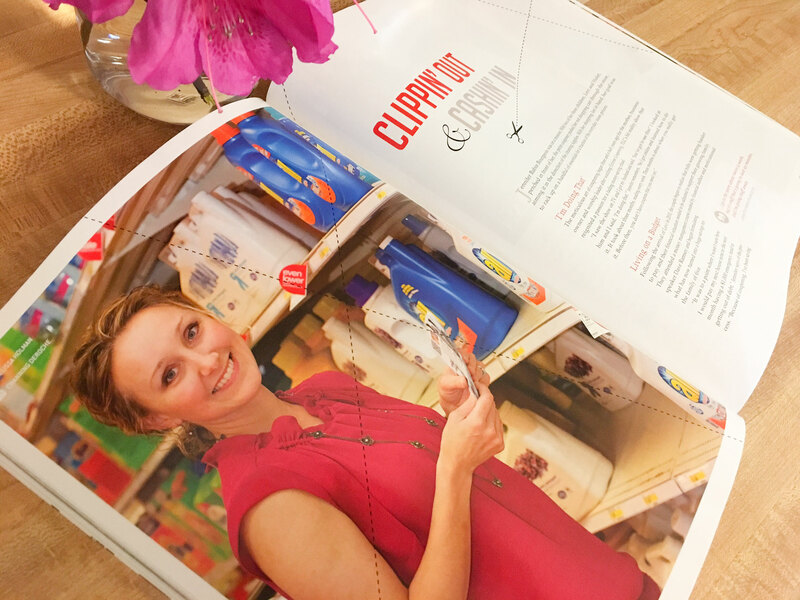 Eventually, the word got to an editor’s ear, and I was featured in the June 2014 issue of Point of Vue Magazine and named the town’s “Coupon Queen!” I was honored and humbled, and I was very excited to share this with everyone. It could be done, even here in our small town. 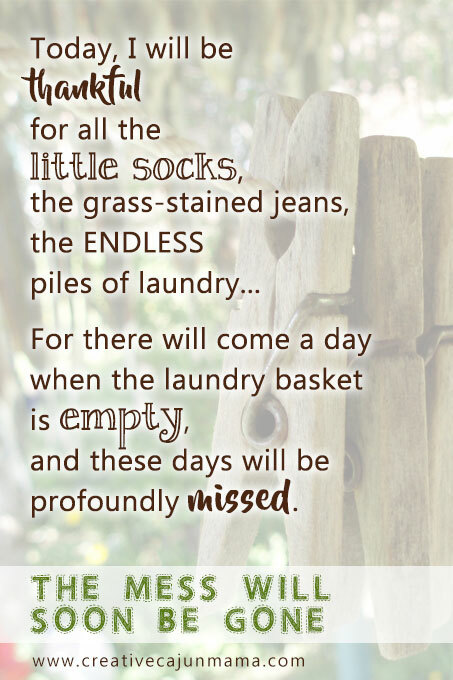 Nowadays, with three kids, homeschooling, sports, etc., it’s a little more difficult to tackle that many stores all in one day. I could do it if I really wanted to, but I really don’t like living in exhausted mode. I know that would really take a toll on me, and I do have more important things to do now. We live about 30 minutes from the bigger town nearby (so that’s one hour total just to get there and back), and it takes us at least 3 hours just to shop two stores and run a few errands. I’m not about to try to do all that with our current schedule. But somehow, I’ve managed to continue to use some extreme couponing methods to score some extreme deals. Ever heard the term, “If there’s something you really want to do, you will find a way?” That’s with anything in life. 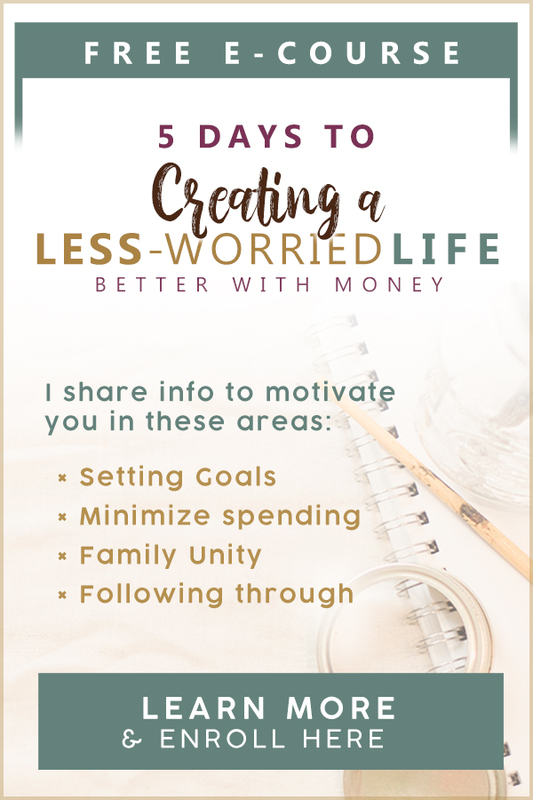 Sometimes, we also have to rearrange some priorities in order to squeeze in something else that might have equal importance – like saving money. Everyone likes to save money, but if we don’t force it into our lives, that money won’t save itself. I’ve compiled a short list of ways to save money and time, while still using extreme-couponing methods. With a little bit of planning (about 30 minutes each week), you can continue your saving addiction. Yes, you must do this. 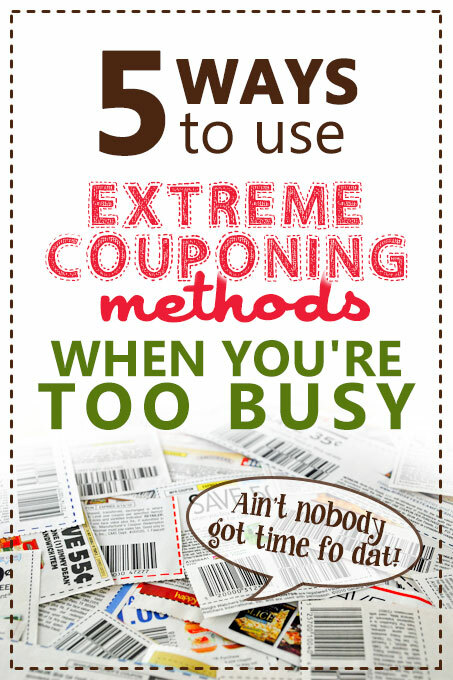 Even with extreme couponing, you can and WILL overspend if you don’t set a limit. You must start with some type of budget so that you know what you can afford each week to spend on groceries, toiletries, etc. Example: Start with your income at the top, and then work your way down with expenses listed below, dispersing your income into different spending categories until you run out of money to disperse. The BEST budget app/program out there is a free app called Every Dollar, developed by the Dave Ramsey team. Most people find that when they make their first budget, they “find” money they’ve never seen before. That definitely happened to us! Give yourself a raise and create a budget! Have you ever shopped for winter clothes in the summer or summer clothes in the winter? This is the same exact deal. You are buying things while they are super cheap, so that when it’s time to wear it, you already have the clothing for the season and you don’t have to run out and go pay full price. We’re trying to avoid full-price here. Therefore, you will be buying baby wipes, toothbrushes, or laundry detergent long before you actually run out so that you don’t have to pay full-price when you do run out. So with that said, you may need a little extra money to actually get started couponing. But, I’m not talking about hundreds of dollars. I’m talking about maybe $5 to $30. For some things, you don’t need any money at all. This is only to start your “rolling rewards” at the drug stores so that when you shop the next time, you have those extra rewards to spend on your next purchase along with your coupons. I’ve also heard people comment on their “brand loyalty.” I understand that you may be loyal to certain brands, and you don’t even want to try new ones. Let’s focus on what we are trying to do here. Depending upon your reason for saving money, you just may need to do what you need to do in order to save. 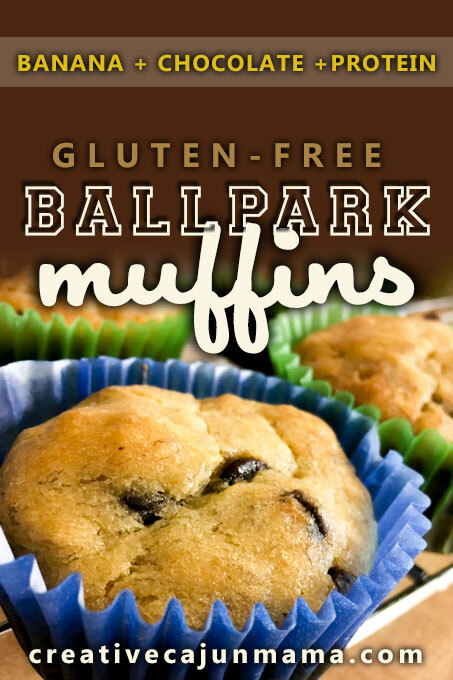 There are a few items that I will not use different brands for, but for the most part, I have discovered many different brands through this process that we now use – all because we gave it a try. There were also some things that I’ll never use again! Those items were definitely put to good use by donating them! When you take a few extra minutes to plan your weekly menu, you can plan ahead what you and your family will eat all week, so that you’re not constantly grabbing something on the go or shopping last minute without a list (Nooo!!!!). It really doesn’t take as much time as you think. When I don’t plan my meals ahead of time, I notice that I feel unorganized, rushed, and I also spend more money at the grocery store. The more you do it, the better you get. Again, don’t give up! Please, don’t give up. 1- Start by looking at what is already in your pantry. Jot down some meals that you can cook with what you already have, and any ingredients you will need from the store will be put on your shopping list. 2- Cook a few meals that will last long enough for leftovers on some days. I usually cook 3-4 large meals per week. For example: Cook Sunday, leftovers Monday, cook Tuesday, leftovers Wednesday and Thursday, cook Saturday, leftovers Monday, and so on. 3- Shop the local Supermarkets. This is my next point in this article (#3). Buy only what is on sale that you can get cheaper than going to the big box stores, and base your menu on what you are buying on sale. This does not always work for those of us who are strictly organic consumers, so it is also important to plan your meals based on what is in season. This is when you can get your produce at a lower cost. Here’s a great article on how to save money while sticking to organic. There are also so many benefits to cooking at home. This may be alarming to some of you who are not familiar with your local prices. If you run out to your local supermarket on any given day to pick up one item you need for your dinner and it’s not on sale, you may spend up to twice as much for that item, rather than picking it up at Wal-Mart with their everyday low prices. This is where meal-planning is also a great addition to your weekly to-do list. Find out when your local grocer’s sales ads come out each week. Here, our local stores’ new sales ads come out on Wednesdays and run until Tuesday. All of them are available to view Wednesday morning on their websites, so there’s no need to drive to the store to pick up the paper or waiting for it to come in the mail. For me, I’ve started a routine that includes waking up 30 minutes earlier on Wednesdays to jot down items I’ll be buying from the new sales ad. If I have any coupons to go along with those sale prices, I will clip it out or print it. Then, I attach it to my list with a paper clip. Wednesday is also my meal-planning day. One of our local supermarkets (Rouse’s) now has “Double-Ad Wednesdays,” so instead of their previous week’s ad ending on that day, it now continues through Wednesday so that we get the sale from the previous week plus the sale from the new Wednesday ad. I can’t miss Double-Ad Wednesday, so that’s why I picked that day for my shopping day. Depending on what’s on sale, I’ll make the menu for the week and write it on my kitchen chalkboard for everyone to see. Shopping your local farmer’s markets will also give you the most bang for your buck on produce. You will most likely find the in-season produce at the farmer’s market. There is a farmer’s market here on Bayou Blue Road. You shop with an “honor system” where you leave your money in the box provided. Cutting out every coupon and organizing them is not for people who don’t want to spend too much time on couponing. If that works for you, then by all means, do it. But if you’re trying to save time, clipping out all coupons is not the answer. No need to buy binders and trading card pockets to get started (like I did when I first started). All you need is some paper clips, paper, and a pencil. 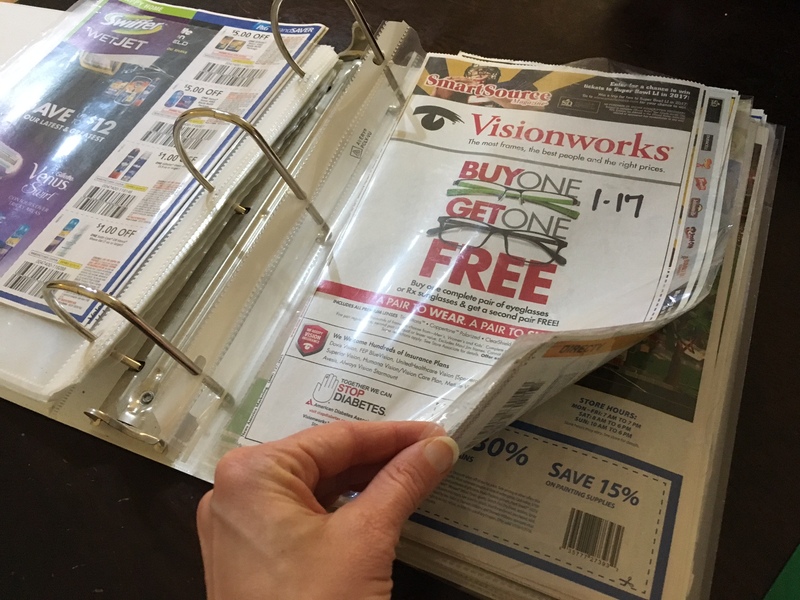 If you want to use a file system for your Sunday coupons, you can simply use a binder with sheet protectors as shown below. Write the date with a marker on the front insert so you know which paper it came from. KCL has a great coupon database when you need to find the coupon you’re looking for in your inserts, instead of searching through every single one to find it. Also, if you don’t want to buy the Sunday paper every week, but you want to use Sunday paper coupons, you don’t always have to buy it. If you start talking to people about the Sunday paper, you’ll find that some people and businesses throw away all their extra newspapers (along with the coupons! Ahhh!! No!!). Ask them if you can take those newspapers off their hands each week. You’ll be surprised to find that they will gladly let you. Every so often, my husband gets a stack of coupon inserts from the heliport when they have leftover newspapers. I will sort through them, and save only the ones I know I will need. I no longer buy Sunday papers every week, and I mainly use my printer to print out the coupons I will need. My ink lasts me a very long time, even with printing out weekly homeschool worksheets. If you don’t have a printer and don’t plan on getting one, there are tons of “cash back” mobile coupon apps out there to use, such as Checkout51, Ibotta, MobiSave, etc. They are rebate apps, which means that you spend money on particular items, and when you “claim” that you have bought those items (by means of snapping a photo of your receipt, etc. ), they will put the rebate in your account to withdraw once it reaches a certain amount (usually $10-20). Like I said before, I got really burnt out, and couldn’t even sleep good when I first started because I was going to every single store trying to get every single deal every single week. I suggest learning one store at a time. Shop that store only, until you are very familiar with their rules, and then move on to the next store to learn. You can find any store’s coupon policy on their website. I find that CVS is the easiest store to learn first. You simply get Extra Care Bucks (ECB’s) when you spend a specific amount on certain items each week, and you can use your ECB’s just like cash on your next purchase. When you simply use your ECB’s along with coupons, and use it on items that produce even more ECB’s, you can get the hang of couponing pretty quickly at CVS. This saves me so much time, so that I’m not spending most of my day clipping coupons and searching for deals. This takes a lot of time all by itself, and full-time couponers can tell you that the money you save is directly related to the time spent on planning your shopping trips. I was so happy when KCL came out with this app. It is so easy to navigate and find what you are looking for. You can search your store specifically or search a product you are looking for, along with a coupon search on their coupon database. This cuts your time in half altogether. 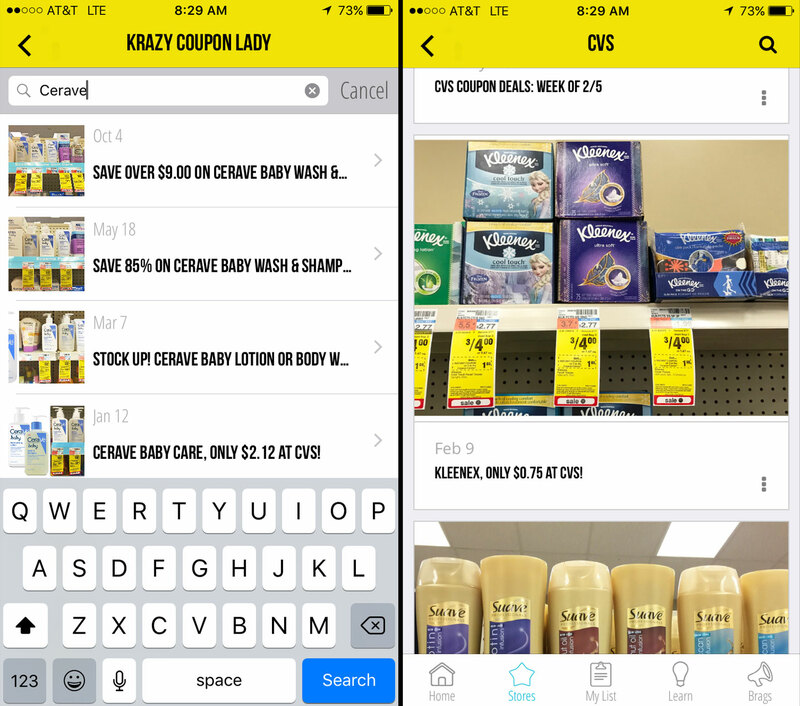 So, if I know I will be running out of toilet paper in the next 2 weeks, I’ll start searching for toilet paper deals on the KCL app by typing in “toilet paper.” It’s sort of a cheat sheet to help you find deals that they have already found for you. Then, if there’s a coupon to go along with it, it is listed right there with the deal. I also use any down-time I might have (riding passenger in a car, soaking in the bathtub at night, etc.) to browse the KCL app and checkout some deals on the weekly ads. I hope this information was helpful to you. If you have any questions, please feel free to ask! I’d like to hear of any tips you may have as well! This article is awesome! Thank you!